On October 15, University welcomed Valeria, Nicole, and Isabella to their first day of school at University. They had just gotten in from Guatemala. 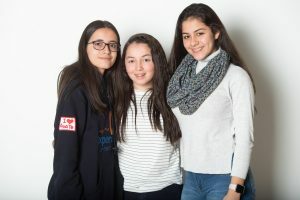 These three students, each of whom is joining our community as part of an exchange program, are the latest in a long line of foreign exchange students at University. Shannon Swann, one of University’s French teachers and the director of our international programs, has collaborated with schools in countries ranging from Norway to China to bring unique and diverse perspectives to the halls of University. Ms. Swann also notes that foreign languages are an important part of this intercultural exchange program. “With students from Guatemala,” she explains, “there is the added benefit of having three native Spanish speakers in our community from a country most University students have never visited, which provides an opportunity for our students of Spanish to have authentic language practice while learning directly about a relatively unknown part of the Spanish-speaking world.” During their time here, Valeria, Nicole, and Isabella will collaborate with University’s Spanish classes and will work on individualized cultural projects. And, of course, as much as we value the diverse cultural perspective that exchange students bring to University, we hope that they derive value from this experience as well. All three of the exchange students mentioned that they hope to improve their English-speaking abilities, and each was excited to get to know more about American culture. Valeria, Nicole, and Isabella will have a chance to present on everything they learned at a morning meeting. While their time with us will end on December 7, their travels will continue with a trip to New York, where they will join the rest of the students in their program. If you are interested in hosting an international student, reach out to Ms. Swann at sswann@universityhighschool.org. Hi, I’m Marlene, Nicole’s mom, and I want to say I’m really satisfied with the experience that my daugther had in the school and with the family. It was helpful for her to know more about the culture and interact with new people. Thank you for everything, specially to the Hakes family for hosting Nicole.